–Graham Greene, on Vietnam’s Caodai cult. It really didn’t make sense. There in front of me, outside the smudged bus window, was “The Great Divine Temple” at Tay Ninh, Vietnam—a whacked-out EPCOTy architectural hallucination resembling Gaudi on opium—and I didn’t really want to go inside. The idea of occult cults creeped me out. Er, would they try to abduct and brainwash me? Hunchback of Notre Dame, as a saint! Way wacko! But the cult sounded at least playful and rococo enough to intrigue me into traveling to a former enemy nation that I was not too keen on visiting. I still imaginatively associated Vietnam with The Deer Hunter, Full Metal Jacket, Platoon, and Apocalypse Now (also, alas, Hamburger Hill, one of the messiest war films ever made). I don’t think any of these films would go over well with the communist authorities; but a British traveler on my bus, bursting with laughter, swore he saw Rambo, dubbed into Vietnamese, on a long-haul bus between Dalat and Saigon. Okay, the Caodais. So this is what I’ve got so far. Here’s the skinny. A bunch of crazy dong tu (mediums) contact the spirit world, querying, say, Charlie Chaplin in his “talkie phase,” via séances—utilizing the usual abracadabra bric-a-brac of Ouija boards (the popular game), table tapping (a table jiggled which taps out letters), and corbeilles a bec (long radiating sticks attached to pens). This is the Caodai Calling. Collect. They also use “pneumotographie,” where a blank card is sealed in an envelope and hung above an altar. When opened, the paper purportedly has a message on it: “Having a great time. Wish you were here. . . .” Postcards from the edge of the grave. Tay Ninh, less than 60 miles northwest of Ho Chi Minh City (Saigon) is an unlikely locus for the headquarters of a major religion, the third largest in Vietnam after Buddhism and Catholicism. Bordered by Cambodia on three sides, Tibet-like Tay Ninh is an almost island of upheaval in a commie country giving babysteps capitalism a go. Our bus passed a scowling teen wearing a Tommy Hilfiger T-shirt peddling Pepsis on a roadside stand, as well as a “picturesque” old coot doffing one of the ubiquitous conical hats and plowing rice paddies with his water buffaloes. More serious, along this road was the site of the famous wartime photo of a young running girl scorched by napalm. Caodai, which means “high palace,” refers to the supreme palace where the Supreme Being dwells (Heaven) and God Himself. But the “palace” rising before us seemed a daring departure from reality. 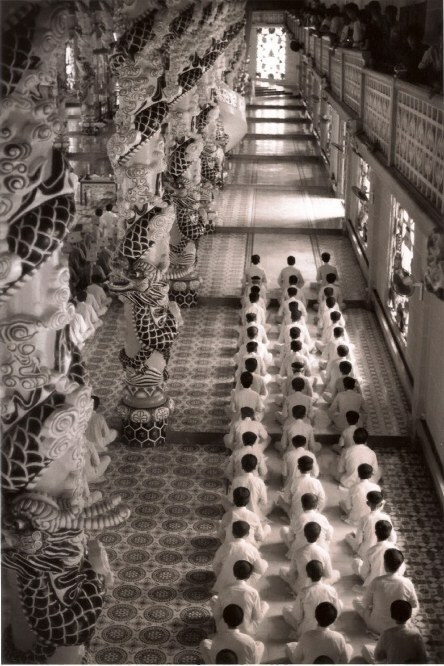 As we got off the autobus and whistled at the Great Divine Temple, the scene became real “Indochine,” with a sea of lithe bicyclists draped in white ao dais on their way to attend one of four daily religious ceremonies. We had come to join them. But I think Graham Greene described it best : “Christ and Buddha looking down from the roof of the Cathedral on a Walt Disney fantasia of the East, dragons and snakes in Technicolor.” But still: “This is it?” a Vietnam vet named Bill from Brooklyn groused. “Yeah, I thought it would be more, I don’t know,” a Canadian girl with long black hair and a scent of patchouli dittoed. “It is very yellow,” I stuck up weakly. Most evocative, up above on the domed ceiling was painted a night sky, divided into nine parts, filled with Van Goghy stars and clouds. Beneath the dome was a blue globe, representing the Earth, with the supreme symbol of the Caodais painted on it: the “Divine Eye,” which bears a suspicious resemblance to the eye in a pyramid featured on the back of U.S. dollar bills. I stared at the Eye and waited for one of us to blink. “You are welcome, Mr. America,” jokes one of the white-robed priests with a Shangri-la smile. He had the easy manner and confident smile of one used to dealing with tourists. The elaborately garbed priest, whom I dub “Les Miz,” is old enough to have witnessed the horrors of the Vietnam War, but didn’t seem the type to hold a grudge. Probably for good reasons. The Caodais were never exactly neutral. In fact, despite their prohibition against harming people or animals, they had their own renegade armies, beginning in 1943 as a response to Japanese invaders. In the Franco-Viet Minh War, the Caodai Army, made up of some 25,000 troops, supported the French, and specialized in making mortar tubes out of auto exhaust pipes. During the Vietnam war they were staunch SVA, fighting on the side of the Americans. 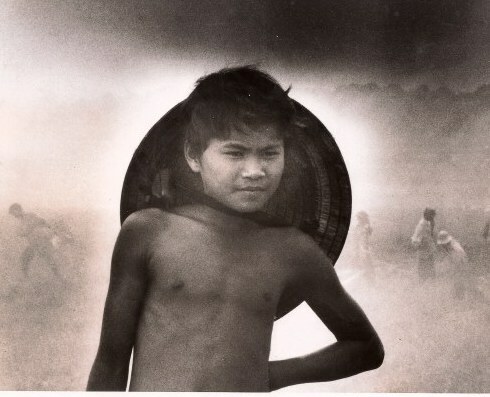 In 1975, when NVA troops overran the U.S-backed South Vietnam, Caodaism was violently repressed and banned by the Viet Cong, who confiscated the church’s lands. There were the usual stageshow executions. But behind the scenes Caodaism continued, with its prayer meetings and séance rituals, surviving even a series of brutal cross-border raids by the genocidal Khmer Rouge. I pulled out a dollar bill and showed Les Miz our own version of The Eye, possibly a Masonic symbol, itself maybe derived from eyes on Buddhist stupas. The Mizter examined the bill with great interest and nodded approvingly. His asterix eyes focused on the hidden footnotes inherent in the symbol itself. After an eternity, his concentrated prune pout relaxed into the palimpsest of a smile. “It was nice meeting you. Now I must go.” He wanders off, still smiling but looking a little shaken. 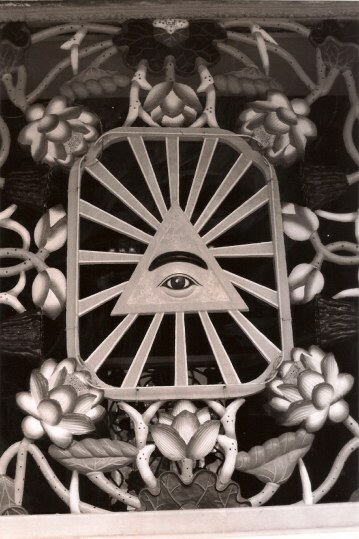 Founded in 1926 by the French-educated Vietnamese mystic Ngo Minh Chieu, the Caodais claim the “All-Seeing Eye” was first seen on the island of Phu Quoc in 1919. God, or Caodai, appeared and said, “The eye is the principal of the heart from which comes a source of light. Light is the spirit. The spirit itself is God.” Then on Christmas Eve, 1925, Caodai reintroduced himself rather grandiloquently (and cryptically) as “Jade Emporer, alias Caodai, Immortal, His Honor to the eldest Boddhisattva, the Venerable Saint, Religious Master of the Southern Quarter.” The starry-eyed Le Van Trung (the first Caodai pope) and his posse presented their “declaration” to the French governor of Cochinchina in 1926, and Caodaism was officially born. By the 1950s, one in eight South Vietnamese were Caodais, carving a sort of feudal state in Tay Ninh Province and the Mekong Delta, filled with thanh that (holy houses). Today there are over 8 million Caodais in Vietnam (roughly the population of Sweden), plus some 30,000 members scattered across the world like chess pieces, usually in places inhabited by Viet Kieu (overseas Vietnamese). Positioning ourselves on the balcony to view the ceremony, we watched the red, yellow, and white robed faithful wearing conical floppy hats pile in. Men came in from the right, women from the left, making their way in a mincing Mozart-like minuet to kneel before the altar. In the back a group of musicians played atonal tunes and chanted hypnotically. It sounded a little like a group of approvingly purring Siamese cats cuddling, then rutting. What what? I almost fell asleep. Oddly, the faithful are not permitted to be photographed, except during ceremonies. After the ceremony we walked to the autobus under a sky with a ghastly pewter pall and a vague threat of rain. “So what do you think?” I asked Bill from Brooklyn. “I think it’s a crock,” he responded. But I wasn’t so sure. As the bus departed, I stared out through the streaming strands of rain at all the Vietnamese faithful getting on their bicycles. Then, too good to be true, I saw a Vietnamese guy with thick Elvis sideburns and a bomber jacket kickstarting his moped and showing off popping wheelies. Way out here in otherworldly Tay Ninh, we were a long way away from Graceland (certainly as showy as the Caodai Temple), but with all these cuckoo cultists capering around like Psychic Friends Network stars, maybe it is not quite as far as we might think. Stuck in the psychic grooves of my gray matter were the words of the Bard, William Shakespeare, “There are more things on heaven and earth than are dreamed of in your philosophy.” Apropros of nothing at all, I resolved to never ever return to Vietnam.